This beach destination wedding got awarded a spot in the top 10 WeddingWire Editor's picks for 2016. Being selected among over 600 real weddings showcased, and the fact that it was Brad and Kevin's, made my heart sing. It was such a beautiful, honest, and emotional day, that I'm proud their event got nationwide recognition. 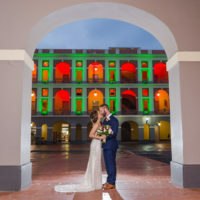 Brad and Kevin were married at the Wyndham Grand Rio Mar Beach Resort in Rio Grande in late April. When we first met through FaceTime, they told me of how important this event would be for them, and how special were the memories they would be experiencing along their closest family and friends. After shooting Brad & Kevin's separate getting ready sessions with their closest friends and family, we headed down to the main lawn area in the hotel to do family photos, after which we did a small set of couple photos around the hotel before Ceremony time. The ceremony was just... too much. I don't think there was a dry eye after their custom vows. I was holding back on my own tears, until I looked at my assistant having a hard time doing the same thing. There was just too much love and excitement. After their newlyweds photo session in the beach area, we went to the reception area, which was beautifully tropical! The couple chose a bright color scheme and beachy decor, which were grounded with classic touches including Chiavari chairs and elegant place settings. My favorite part was the custom cake-topper, featuring the cutest beach chairs with their names. The reception continued to be a beautiful, heartfelt event, followed by a lot of dancing. I was just so happy to be there and to be trusted with such delicate and special memories. Best wishes to you Mr. & Mr. Knight!